“Have you never been in love? 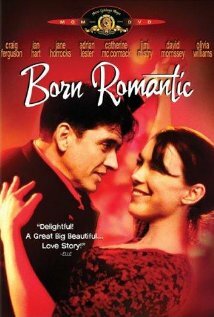 Now this is a curious thing – released in 2001 but feeling very much a child of the 90s, Born Romantic is a British rom-com written and directed by David Kane, centring on a salsa club in London and the romantic capers of the men and women to attend. It has a highly personable cast – and there’s always fun in seeing familiar faces with a much fresher hue about them – but this is fairly bog-standard, low-budget stuff. It says nothing new about relationships, metropolitan living or indeed anything exciting, it just putters along in a rather inoffensive manner that makes it hard to recommend. For those who know their US late-night chat-show hosts, there’s still fun in seeing Craig Ferguson in a straight acting role, one of three main “romantics” of the multi-stranded story. His Frankie is a hapless divorcee, still co-habiting with his ex played by Hermione Norris, and struggling to wangle his way into the affections of emotionally distant art restorer Eleanor, the divine Olivia Williams who like everyone else here is treading water. Kane’s writing hits on some interesting points but rarely gets the opportunity to delve beneath the surface as the narrative skips around the numerous other storylines, barely scratching the surface of any. Jimi Mistry’s Eddie is a hapless mugger who falls for one of his victims, Catherine McCormack’s “absentee grave tender” (I know…); David Morrissey plays Scouser Fergus on the hunt for Mo, the woman he dumped years ago but who has decided is now the one. There’s at least enjoyment in watching a youthful Morrissey and Horrocks spark off each other with Liverpudlian accents but it’s just a shame that it is all essentially in vain. An additional thread that connects them all is Adrian Lester’s cab driver Jimmy, watching resignedly from the sidelines to start with and then increasingly interjecting to ensure the path of true love, or the next best thing, runs smooth. The best bits come with Jimmy’s colleagues, as Ian Hart and John Thomson regularly shoot the breeze in a greasy spoon, swapping banter and jokes in a genuinely conversational style that is lacking elsewhere. Born Romantic is never offensively bad, it’s not even really that boring either – but crucially it is just dull and so I’d be hard-pressed to say it was worth the time, even for fans of these actors.